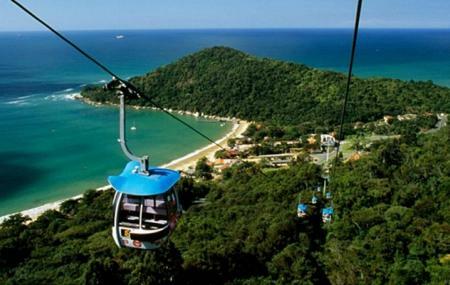 An Amusement park, the Parque Unipraias Camboriu is loaded with rides and known for its iconic cable car rides to the Laranjeiras beach. The park is located close to the pier and a pebbles’ throw away from the popular nightclub ‘Shed Western Bar’. The place also has a trekking area where you can trek through lush green forest and if you are lucky you may even come across a few animals. Visit the official website for rules and regulation. The place has a small food court where you can get light snacks. How popular is Parque Unipraias Camboriu? People normally club together Cristo Luz and Molhe - Barra Sul while planning their visit to Parque Unipraias Camboriu. People also prefer to start their day with Parque Unipraias Camboriu. Smaller sugar loaf mountain. New, clean and fun. Crowded when cruise ships are at the harbor because most passengers visits the place. It's certainly the best attraction in Balneário Camboriú and it's getting better year by year as they add new rides. Every ride has to be paid separately. Parking at Laranjeiras can save you up to 70%. Great view from both of the lookouts! Great look out point to see the city beachfront. Park closes at 6, so it's hard to catch the sunset, but still enjoyable.